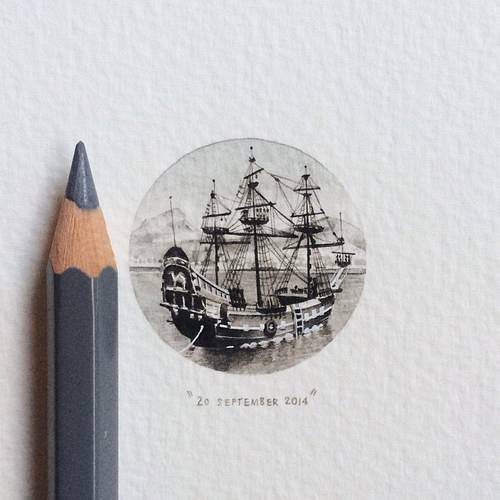 Lorraine Loots is a South African artist who, in 2013, started on a project called 365 Postcards for Ants. 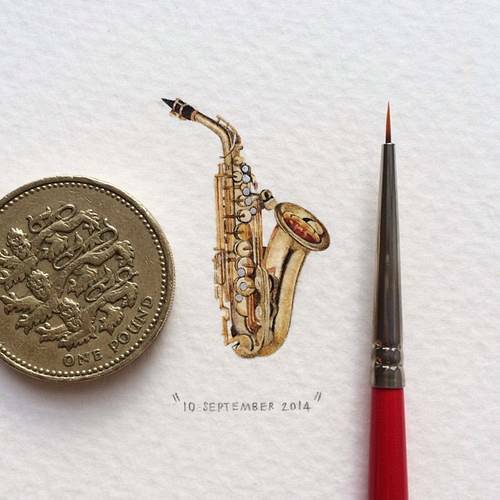 It involves her ‘creating a miniature painting every single day for the entire year,’ and not only is this a fantastic project, her website represents a great way an artist can promote and sell their work online. 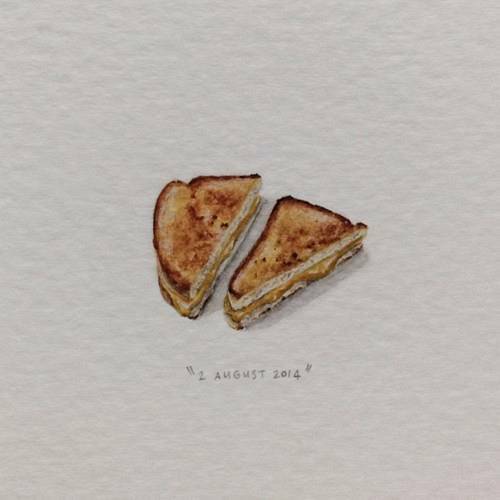 Lorraine’s project involved people booking sentimental dates for themselves in her calendar and requesting a subject for the painting that resonated with them. Subjects ranged from musical instruments to fauna and wildlife, and were tiny! Original paintings will be 12.5cm x 12.5cm, framed in raw wood. Lorraine has decided to make this year’s postcard theme run in celebration of Cape Town, her home city, becoming the World Design Capital of 2014. This narrows down people’s requests a little, requiring some relation to her city. Each person can suggest five themes, and the most relevant to Lorraine and the city will be her choice. Lorraine’s use of the calendar is perhaps one of the most interesting things- aside from the paintings- about her project. By letting customers pick their own date on a calendar across a whole year, they are enabled to pick days with resonate with them emotionally. This is a brilliant and unusual way for an artist to market themselves and raise interesting in what they’re doing, not only from potential customers, but also art bloggers and news sites, being featured in more than 200 news and blog posts (based on data from ahrefs). We have asked Lorraine for her thoughts on her continuing popularity, and hope that we hear from her soon! lorraine’s paintings for 2014 can be ordered from her website, any time from October onwards. The original paintings cost 900 Rand, while a print of the postcard costs 400 Rand, working out at just over £20, not including shipping. There is usually a wait before your postcard or painting will arrive as they’re booked well in advance, but no one has been complaining yet. Have you ever tried similar ways of promoting the sale of your work online? We’d love to hear them, if so. This is brilliant and good luck to her! BUT personally speaking, I’ve tried everything I can think of but NOTHING WORKS! As you will see, I’ve had a book of brilliant poems published on Amazon which have been compared with those of Wordsworth and Tennyson – I’ve put Dingo and his friends ,who are as funny and as topical as anything being done by the world’s best today, everywhere I can think of – I’ve written fabulous music, painted beautiful pictures – but has anyone noticed? Not on your life! If I thought it wouldn’t frighten everyone I’d make Dingo and Ebenezer stand on their heads without any clothes on but with my luck no- someone would just call the police and get me arrested for encouraging indecent exposure! I wish you’d do a great favour and tell me the secret behind becoming rich and famous as I’m utterly fed-up with eating the dog’s left-overs! Besides, I’m 81 and haven’t must time left!